European Union chief Donald Tusk on Saturday (10 November) accused US President Donald Trump of being averse to a “strong and united” Europe and also warned against the emergence of a “brownshirt” nationalist front in EU elections next year. His comments came as Trump, in France for World War I centenary commemorations, blasted French President Emmanuel Macron over his proposals for a European army. “For the first time in history we have an American administration that is, to put it mildly, not enthusiastic about a united and strong Europe,” Tusk said in a speech in his native Poland. “I’m speaking about facts, not propaganda,” Tusk — a possible future Polish president — said on the eve of celebrations to mark Poland’s 100th anniversary of independence. The EU Council president has previously voiced fears that Trump was seeking to tear down the post World War II order, with the US leader once calling the EU a foe in trade. In an interview published Saturday by the Polish newspaper Gazeta Wyborcza, Tusk also said he believed Trump wanted a world with “the United States on one side and on the other, a disparate collection of other countries”. Trump on Friday fired off a tweet berating Macron’s calls for a European army, but the French president on Saturday sought to ease the row, hailing the “great solidarity” between the two countries. Looking ahead to the European Parliament elections in May, Tusk warned against the emergency of a nationalist front opposed to the EU itself. The former Polish prime minister also spoke of rising anti-European sentiment in several capitals, saying some forces wanted “conflict rather than cooperation, disintegration rather than integration”. 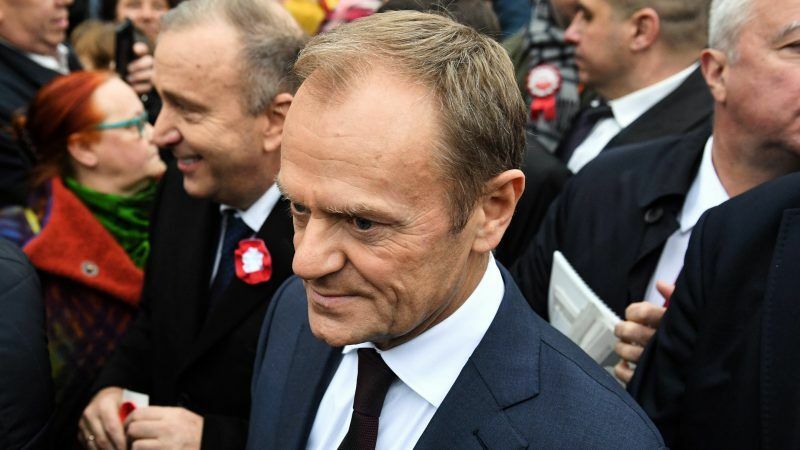 Without naming names, Tusk criticised Polish leaders for their stance on Europe, after this week warning that the eurosceptic ruling party’s policies carried the risk of a “Polexit”. “Those who are opposed to a strong Polish presence in Europe are de facto against our independence,” he declared. Let’s celebrate our freedom every year on Europe Day thanks to a united Europe, with big music parades in all 28 EU capitals (and subtle messages about the EU on floats), to be organized by the youth, because they represent HOPE! And make Europe Day a free public holiday across Europa, so people can participate wherever in the EU. Organizing street festivals is not expensive, and when programmed wisely, these marches/parades can create an atmosphere of togetherness and solidarity, and help reduce nationalism, euroscepticism and populism…!! Trump reacted to Macron’s statement that the EU needed an army to defend itself against the United States. Its not often I agree with Trump but what Macron said ignorant and insulting. There was never a good time to say such a thing but on the 100 year anniversary of WW1 ending just beggars belief. Can you imagine the reaction in the US where not only will many families have members who died protecting europe but who continue to caryy the bulk of the financial burden. What Macron said is, that Europe has to defend itself “in respect ” to Russia, China and even the United States. What he suggested was achieving a level of independence, not to prepare for conflict. With the US withdrawing from nuclear treaties, with a US involved in wars right around the globe, with a US involved in developing entirely new classes of independent, autonomous weapons, and with the US openly considering China a military threat; perhaps we should take him a bit more seriously. Europe needs it’s own defence, it needs is own army rather than blindly rely on American “protection”.